Mike grew up on a farm in Preble County, Ohio (Western Ohio). His family raised cattle and hogs along with corn and soybean crops. While on the farm, Mike and his brother Chris helped with farming duties encompassing as much as 800 acres of farm land. 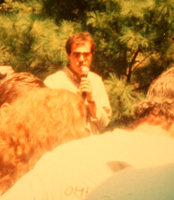 Mike frequently attended auctions with his father. It was rare that a week went by that he and his father didn't attend at least one auction in the area. By age nine, Mike had decided what he wanted to be when he got older. After graduating from Eaton High School, Mike went on to attend The Ohio State University. He graduated from OSU in just over 3 years with a degree in Mathematics. Mike then attended Missouri Auction School and began his auction career shortly thereafter. Mike's first work as an auctioneer, following auction school, was for a Halloween fund-raiser at the Concord Church, near his boyhood home. Members dressed up in costumes; Mike sold baked goods, artwork and crafts, raising over $2,000 for the church. Even before attending auction school, Mike took and passed the Indiana Auctioneer test. He then began helping Jim Kottyan, Auctioneer in Richmond, Indiana. When a business such as our auction company needed to expand and require more assistance from staff members, we continued to be blessed with some of the very best auction staff available. 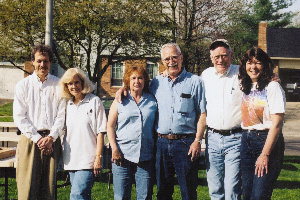 Pictured here in 2004 are Mike, Linda Godwin, Sue Rheinscheld, Merlin Rheinscheld, Tom Klug and Norma Welch. Our client wanted to take this picture to remember us for doing such a good job. She sent us a copy of the photograph to distribute to our staff. Today, Mike Brandly, Auctioneer maintains offices in Groveport, Ohio. He holds year-round auctions (every Wednesday) plus twice-monthly car auctions in addition to special event auctions around the United States and periodic contract auctioneer work in the Midwest. The Ohio Auction School provides pre-licensing auctioneer classes are held twice per year, with other special classes held throughout the year at our auction house as well as other locations.